This heroic bug returns but his life is still a rollercoaster ride. He needs your help to survive the hazards of an underground world where hungry monsters lurk in the darkness waiting to pounce on this little bug. Loaded with tons of tricks, stunts and weapons you might stand a chance. Move around using the arrow keys. At any time during the game you can get a map and get hints where to go next. Choose and switch your weapons any time and advance through the insect underworld. 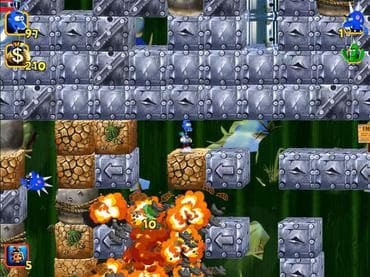 Free Game features: - More Than 70 Levels; - Tons of Wacky Characters; - Brainteasing Puzzles; - Two Level Packs. If you have questions about Beetle Bug 2 game, please contact us using this form.